From Casal, take IP8 toward Figueiró dos Vinhos and then N236-1 to Castanheira de Pera. Keep going on the N236-1 towards Lousã, about 10 km after leaving Castanheira de Pera, turn right and go to Poço de Corga. Park the car and go for a stroll around the leafy park with hundred year old oaks and a river beach. There is a bar/restaurant nearby for whatever refreshments you might need. 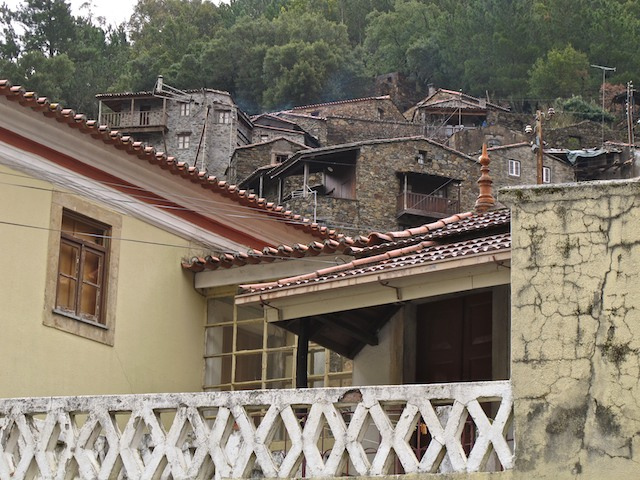 Return to N236-1 and enjoy the drive toward Lousã, climbing up the mountain amongst pine trees, eucalyptus and chestnut trees until you find Schist Village, Candal. By now, you probably have already stopped several times to appreciate and photograph the scenery but here it is compulsory to park and wander about for a time. If you are energetic enough to enjoy the homes and the peoplemall the way to the viewpoint on the top, you will be rewarded by a magnificent view of the valley of the Candal’s stream. 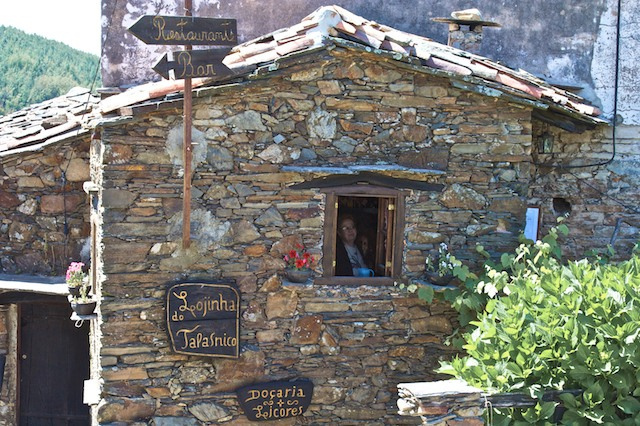 Don’t miss visiting the Loja do Xisto (Schist store) which has many quality products manufactured by local artisans and artists. 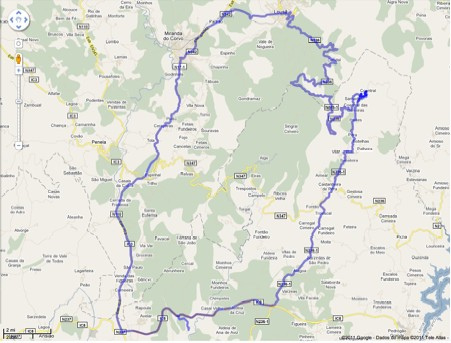 Back on the road, proceed in the direction of Lousã. Go slow and enjoy this winding road, through an evergreen forest with soaring cliffs protecting an enchanted valley. Pay particular attention to the right and you will see a sign directing you to Talasnal. If it hasn’t rained a lot recently turn there, drive carefully if in a car (if you’re driving a four wheel drive vehicle there should be no problem. You can park the car at the square at the end of the gravel road and explore this Schist Village. If you have time to eat you can try Ti Lena, it is always advised to call in advance and make a reservation (see “Where to eat” at this site) to be sure of getting a spot and to make sure it is open for business when you plan to visit. Once at Lousã, enjoy the architecture of the eighteenth and nineteenth centuries in the old part of the city where you will see several manor houses and the Palace of Salazares or Espinhal Viscountess, recently turned into the Meliá Hotel. Lousã is also known for its house tiles that can be admired at many places, particularly the City Hall and the Railway Station. From Lousã take N342 towards Miranda do Corvo. 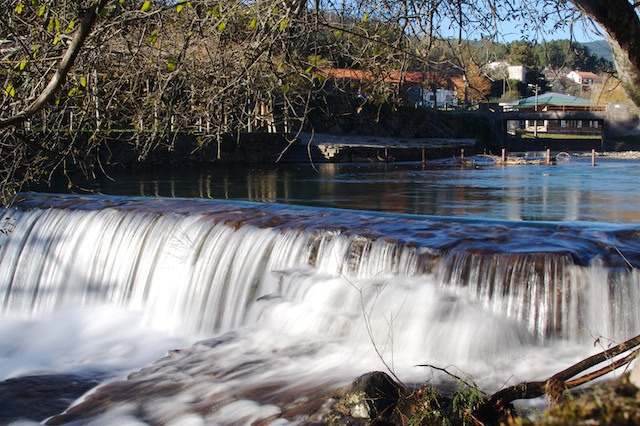 At Miranda do Corvo (site only in Portuguese), look for local crafts, including pottery, lace, baskets, tin and weaving. There are more artisans here than almost anywhere else in the country. If you are visiting on the first Sunday of the month, be sure to drop by the Flea Market and acquire some ‘antique’ Portuguese treasures (in the summer it is at the Praça José Falcão, if it is winter it is at the Municipal Market). If you have not eaten, be sure to try a chanfana (roasted old goat) cooked according the original recipe. If there is time, continue along N110 towards Penela and stop and visit the fine Castle whose walls contain the Church of St. Michael. Be sure to take in the famous pillory with its octagonal column with four iron snakes with iron rings in their mouths. People say that it was widely used in middle ages for badly behaved citizens. It has been a long and hopefully satisfying day and it’s time to return to Casal de São Simão. Keep going on IC3 until the junction with IC8. Head for Figueiró dos Vinhos and you will soon be back home.